SEAMAN JOB INFO - Intermarine Shipmanagement Corporation POEA-001-SB-021816-UL-MLC opening careers for Filipino seafarers crew join on VLGC, Oil Product, LPG Ammonia Tanker Ship deployment December 2018 - January 2019. - CHIEF ENGINEER FOR VLGC 48,000 GRT. FULLY REF EXP. - CHIEF MATE FOR VLGC 48,000 GRT. FULLY REF EXP. - ELECTRICIAN (ETO) FOR OIL/PRODUCT 62,000 GRT. For DEC.
- 3rd ENGINEER FOR OIL/PRODUCT 62,000 GRT. For JAN.
- ABLE SEAMAN FOR LPG AMMONIA EXP. For JAN.
- (2) ASST.COOK FOR TANKER EXP.W/ US VISA. Share to help other seaman looking jobs at sea. Maritime & offshore career. Singapore jobs open to foreigners. 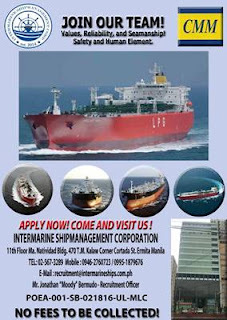 New jobs in maritime industry. 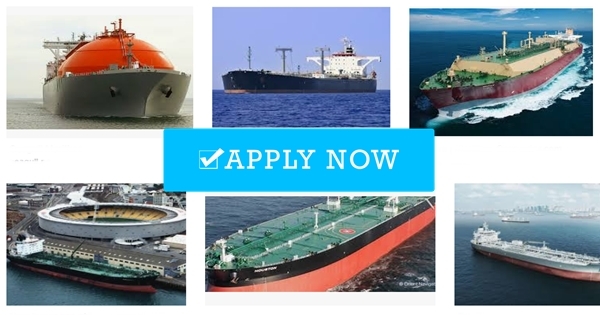 0 Response to "Hiring Crew For VLGC, Oil Product, LPG Ammonia Tanker Ship"